Netizens were on outrage when news about Facebook charging $2.99 per month starting November 1 goes around the social medias. Confused readers thought seriously on the satirical news article written in the website National Report posted two days ago. The article that was suppose to be a satire used made up statements by by Facebook CEO Mark Zuckerberg. It also made some supposedly funny and entertaining comments by some made up characters who had reacted to the news. The article was shared more the 1,100 times on Facebook and re-Twitted more than 2.5k times. At the end of the article, it says that people could be exempted from the fee by posting a statement that they are don’t have resources to pay and use the hashtag #FacebookMonthlyFee. The article garnered shocked and angry reactions from netizens and others even promised to delete their Facebook accounts before November 1. 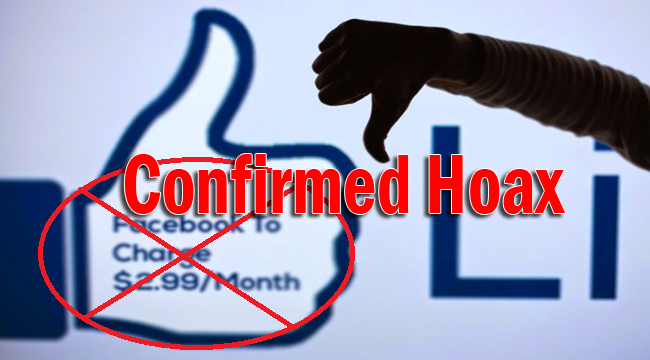 Facebook clarified that they would not charge fees as said in the National Report article. Facebook released a statement that they would add a tag ‘satire’ on the news feed from parody news outlet. Satire is used to make jokes on things that are seemingly serious. Usually it aims to show weakness of the society, individuals or government. National Report is a satire website created to post article that are only made up but were based on real issues in the society both national and international. One of the recent articles posted is about the Catholic church being the mind behind ALS Ice Bucket Challenge to baptize a lot of people.